Overwatch has a Sticky Jumper. I couldn’t believe it when I found out. Junkrat’s playstyle is almost identical to my single most preferred playstyle in TF2. I just spent about two hours on the training map reaching all sorts of insane places with the concussion grenade. I am going to fall in love with this character, I just know it. Now, let be fair; he’s not as mobile as a Sticky Jumper Demoman. For one, he only gets one (recharging) conc grenade so he can’t fly particularly far with each jump, and he can’t chain them. No air pogos, no cross-country flights….but no fall damage on the other hand, so you have a completely different set of priorities when playing him. He’s far more of a grenadier class than an acrobat. But oh how great those grenades are. The launcher is perfect, and I’m already quite good with aiming it due to almost 1000 hours of these babies. His E-attack is a bear trap that snags unwary enemies, leaving them rooted to the spot and open for easy targeting, and is extremely good for locking down corners. If you know an overzealous Tracer plans to follow you through that doorway, leave a bear trap behind you and turn the tide of the matchup. Sadly, he’s not as versatile as some other heroes like Soldier 76 and Lucio because he’s completely lacking in healing abilities. That coupled with a very high self-damage potential leaves him very reliant on healthkit spawns and his teammates, and this is a lot more annoying in Overwatch as opposed to TF2 because of the lessened mobility options. But that might just be my bias since nobody loves the Sticky Jumper more than I do; I’m sure to most players he’s plenty mobile. His custom skin is particularly bad at making him look like a completely different character. Doesn’t mean I don’t wish I had it. His ult is something to write home about as well. Taking the wheel off his back and revving it like a chainsaw, he sends it rolling away from him with remote control. It’ll roll for a maximum of ten seconds before detonating with a very powerful blast that decimates any unlucky enemies. While it’s quite nice when it does work, it comes with a number of easy counters; the wheel can be destroyed by enemy gunfire, and from my experience it has very little health so you need to be stealthy with it, which isn’t always feasible. 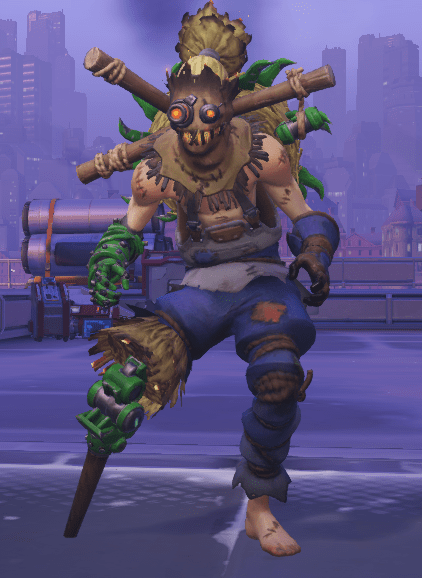 Junkrat himself is also standing somewhere completely blind and deaf, meaning that if you picked a poor place to fire the ult you could find it cancelled due to your death instead of the wheel’s. Considering D.Va gets an extremely similar ult without these problems, it honestly bugs me a little. And call me petty, but my favorite ability of his is “Total Mayhem”. When Junkrat dies, he drops a litter of explosives that explode in his wake. Nothing like bringing your killer to the grave with you.